Everyone has a different definition of cottage, and this house plan offers a rustic interpretation. Stylish and practical, its European-inspired exterior and modern layout exude warmth the minute you see the home. Stone, stucco, and clipped gables outside give it a cottage feel, while tray and coffered ceilings and abundant windows open up the interior of the house plan. An island kitchen has a view to the great room and dining room, and has plenty of counter space and a nearby walk-in pantry. The master bedroom features a curved wall of windows and an oversized shower in the master bath. 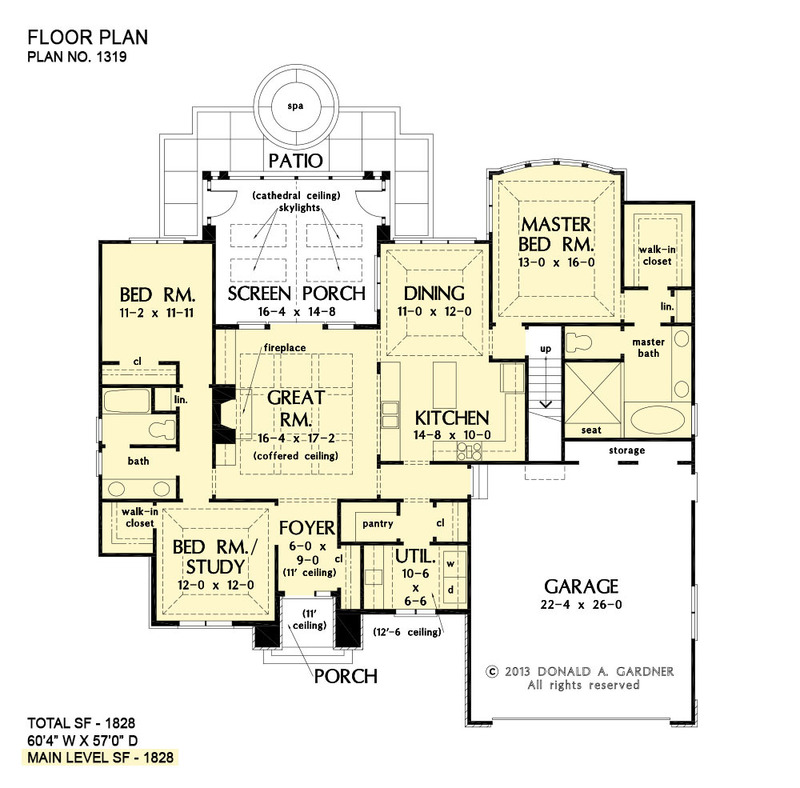 Storage abounds this house plan with linen closets for every bathroom, a large utility room, and additional storage in the garage. 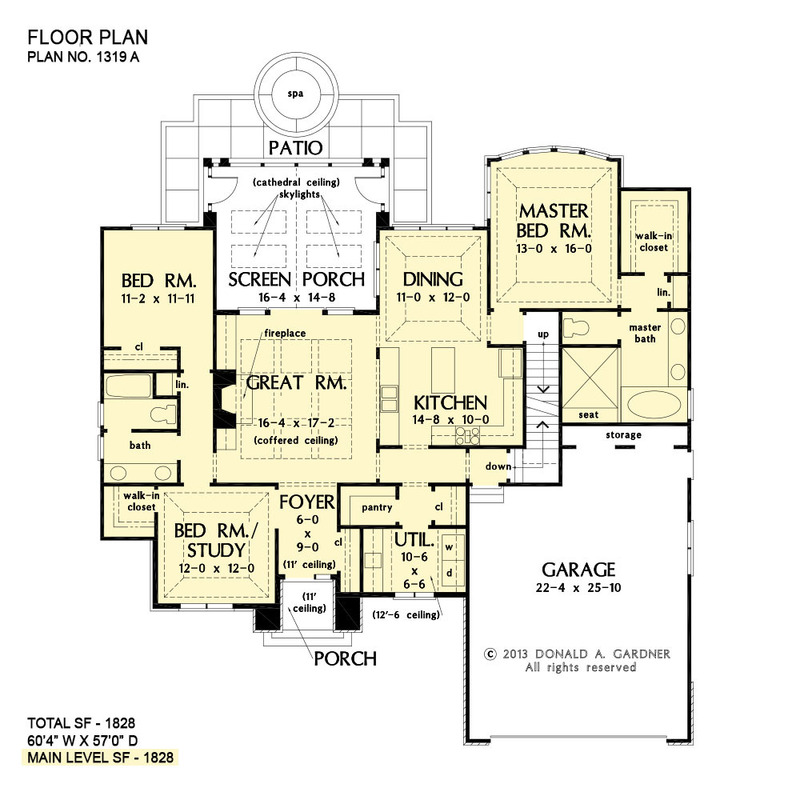 This single living space home also offers a family-friendly 411 sq. ft. bonus room which awaits your expansion ideas. You'll also enjoy the screen porch and patio for relaxing and entertaining. 1st Floor: 1828 Sq. Ft. 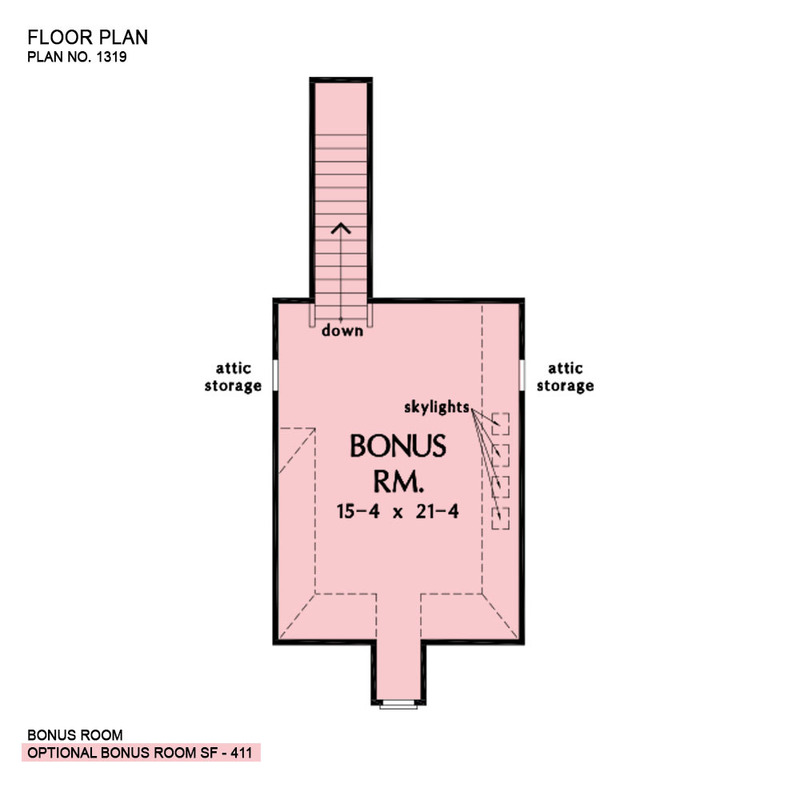 Bonus Room: 411 Sq. Ft.
Porch - Front: 43 Sq. Ft.
Porch - Screened: 272 Sq. Ft.
House Dimensions: 60' 4" x 57' 0"
Great Room: 16' 4" x 17' 2"
Dining Room (Tray): 11' 0" x 12' 0" x 11' 0"
Kitchen (Flat): 14' 8" x 10' 0" x 9' 0"
Utility Room (Other): 10' 6" x 6' 6" x 9' 0"
Bonus Room (Clipped): 15' 4" x 21' 4" x 8' 0"
Garage (Flat): 22' 4" x 26' 0" x 0' 0"
Patio - Rear (None): 27' 8" x 16' 4" x 0' 0"
Master Bedroom (Tray): 13' 0" x 16' 0" x 11' 0"
Bedroom / Study (Tray): 12' 0" x 12' 0" x 12' 0"
Bedroom #3 (Flat): 11' 2" x 11' 11" x 9' 0"
Porch - Front (Flat): 5' 8" x 5' 2" x 11' 0"
Porch - Screen (Cathedral): 16' 4" x 14' 8" x 17' 0"
Great Room (Coffered): 16' 4" x 17' 2" x 13' 0"
Garage Storage (Flat): 12' 10" x 2' 0" x 0' 0"
Foyer (Flat): 6' 0" x 9' 0" x 11' 0"